Visiting Venice without a guidebook is no problem at all. The city is compact, the lay-out is simple and most sights can be reached on foot. If you feel uncomfortable without a guidebook, get a map and booklet describing all monuments from the Tourist Information Office at Venice Santa Lucia Railway Station. I always look for less obvious sights, such as doorbells and doorknobs. Look high up at the picturesque windows on the second or third floors. Discover wrought iron balconies, pilasters and palazzos. Shop windows displays are another delight; papier-mâché masks, wooden Pinocchio and glassware from Murano. When I want to avoid the tourist crowd, I take the vaporetto through Canal Grande to San Elena, a residential area. I love to wander through the streets lined with washing and drink my espresso standing at the bars chatting with the locals. 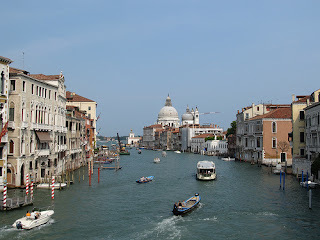 I love to arrange my own sightseeing trip along Canal Grande. Early morning is the best time of the day because morning sunlight turns the palazzos on the shore into magic. Take Vaporetto no.1 from the railway station or the bus station to Lido. This is the first stop, and if there are not too many other tourists, you can sit in front, the best place. Mornings are best because the canal is full of boats that transport supplies to and from the hotels and other businesses. You will see courier services delivering parcels and hotel laundry being collected. The fire brigade barge glides past, six officers on board. The vegetable boat delivers fresh strawberries and artichokes. The water police keeps order. They all sail up and down Canal Grande, intermingling with tourists in gondolas pushed by gondoliers in blue-and-white striped jerseys. When I want to get away from the bustling city centre, I take vaporetto nos. 12 or 13 from Pier Fundamentoa Nuove to Murano, one of the largest island in the lagoon. 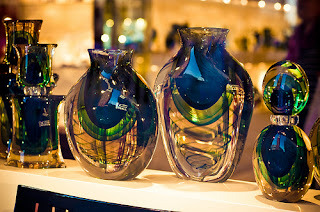 Murano is famous for its glass factories, which you are free to enter. Here you can see the glass blowers at work and take home a hand-crafted glass souvenir. Each factory has its own artistic style. You can buy glass vases, glass figurines, and lots more in the factory showrooms or in the shops in Murano or in Venice itself. The smaller shops in Venice sell rejects. They are easy to recognize, because the prices are much lower than the objects without flaws. Rejects are never advertised. You will have to find out for yourself, but it is not difficult to see, as the shapes are not quite right and there are too many bubbles in the glass. I always bring cash, if I think I am going to buy. If you pay by credit card, you cannot negotiate the price. Come with a bag of money, as museums and churches all charge hefty entrance fees. Venice restaurants are not cheap; expect to pay anything from €40 to €100 for a three-course menu. Before you stretch your weary feet and treat yourself to a cappuccino study the price list. €3 may seem high, but when you have decided to sit in Piazza San Marco, it is not unusual to pay €8. 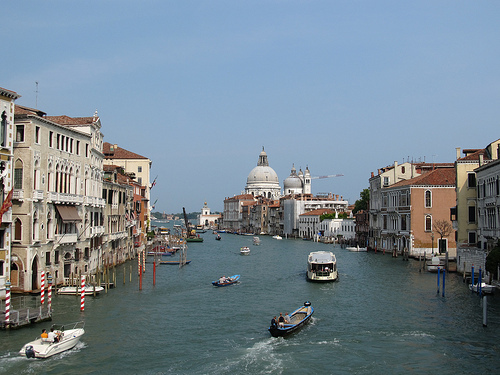 Visiting Venice without a guidebook is very easy. Should you want to visit with a travel guide, I can recommend DK Eyewitness Top 10 Travel Guide: Venice. It is a brilliant guide book with tons of useful information. Not only does it give details about what sights to see, but the book also gives interesting details and what to look out for. It is packed with information, but small enough to carry in your coat pocket. You will see mail services providing packages and hotel laundry washing being gathered.